Take advantage of natural light and the indoor climate of your living space to grow fresh produce right in your own home. 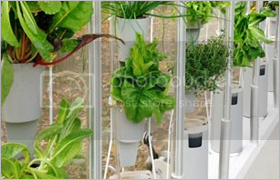 The Windowsfarm uses hydroponics, which is basically a liquid soil. Nutrient rich water is pumped up from a reservoir which sits at the base of the system, and it trickles down from plant to plant bathing the roots along the way. Water and nutrients that are not absorbed will collect in the reservoir and are recycled though the system. This very efficient method of growing food is perfect for an urban garden, or rather one that requires you to conserve space. Many hydroponic systems use both a water pump, and an air pump to aerate the water. 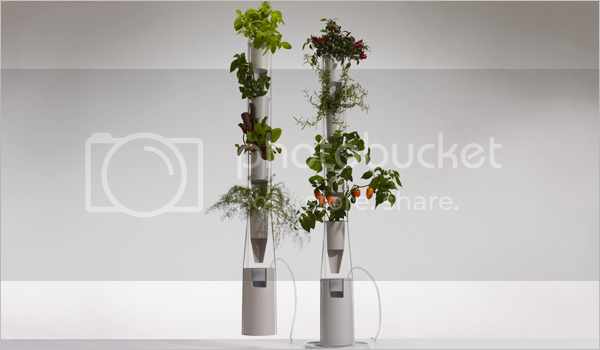 Windowfarms use only the air pump to do the work of both pumps. You will be able to grow almost anything in a Windowfarm, except root vegetables, like potatos or radishes, or plants like corn or wheat that are too tall for the system. If you use the 15 minute off/on timer setting as recommended, Windowfarms estimates that it will cost a few dollars per year for the average US household – to run the system year round. Approximately $1.58 for the 2-Column Unit and $3.16 for the 4-Column Unit per year. To learn more about adjusting to your window’s micro-climate, or to read more about the unit itself visit the Windowfarms indoor garden site.